Civilizations have always exploited the vastness of the ocean for transport and trade. Shipping transportation has been the strength and power of great empires. Ancient civilizations pushed nautical limits to hazardous extremes. Many ships with their crew and cargos were lost on the high seas, on rocky coastal shorelines, and even in calm water harbours. Among these shipwrecks are well-preserved relics of a past humanity. Nautical archaeologists attempt to recover the watery remains, preserve them and investigate the culture and behaviour of people who sailed the seven seas. The great majority of underwater archaeology is conducted by nautical archaeologists. Nautical archaeology tends to specialise in the investigation of ships and shipping including the study of construction techniques and the operation of all kinds of ancient watercraft. The nautical specialist focuses on shipwrecks and by necessity much of his expedition work is conducted underwater. It is not only sunken shipwrecks that are of interest to the archaeologist. Many ancient settlements have become abandoned as their once prosperous harbours and ports slowly silted up. Cities, in the past, have been destroyed by massive flooding or ocean inundation as in a tsunami. Rivers, lakes and wetlands are also places of interest as these too have been popular locations for cities. There is a rich physical record of drowned artefacts along historic shorelines, deep in the mud of lakebeds and swamps and along the banks of many ancient rivers and waterways. Practitioners of underwater archaeology are essentially interdisciplinary, incorporating methods and knowledge from a host of allied fields such as geology, oceanography, history and anthropology. Coupled with these academic disciplines are the practical skills of SCUBA diving, nautical navigation and the general ability of sailing. Most underwater archaeological research is conducted using basic self contained underwater breathing apparatus – SCUBA equipment. In the main, shipwrecks are found in relatively shallow waters having been wrecked by rocks or driven onto coastlines by unmanageable winds. Therefore, the great majority of diving is undertaken at up to only moderate depths. However, there is always an element of danger when diving, even in shallow water. Breathing lines and other equipment can easily be caught on a wreck’s many obstacles and protrusions, trapping a diver or cutting the air supply. Deep diving requires specialist training to ensure safe operation. Underwater archaeologists have borrowed deep dive methods from commercial marine operators, the navy and ocean scientists. Underwater robots and cameras are often employed for deep-water archaeological excavation. The goal of all archaeology is to better understand past human culture and behaviour. The underwater archaeologist embarks on this study in a specialised environment. It presents a number of challenges and necessitates a special approach. For one, humans do not live underwater and therefore the site is often not in usual context. 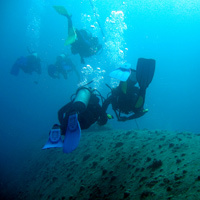 Secondly, being underwater presents numerous difficulties when locating sites, gaining access to them, recovery of any remains and the preservation of the site and its artefacts. Researchers extensively study all forms of historical records in order to discover the possible whereabouts of underwater sites. The best sources for locating shipwrecks are the ship owner’s records, maps, charts, usual shipping routes, logs, registers and the cargo manifest. As well as these, the interrogation of previous explorations, survivor and eyewitness accounts and any government or legal records may assist in site location. Survey techniques such as aerial mapping are commonly used to help locate terrestrial archaeological sites. However, these methods prove almost useless in marine archaeology. Submersed archaeological sites require sophisticated magnetic and acoustic sensing equipment to locate them accurately. There are hundreds of underwater archaeological projects being undertaken throughout the world. Some are in the pleasant warm waters of the Gulf of Thailand where divers are working on sunken coastal traders that met their end with all their cargo still aboard. Other wrecks are in chilly seas like the Viking ships around the Scandinavian coast. Whether investigating the warship Mary Rose, in England; the Batavia in Australia; or whaling ships in Canada the endeavours of professional underwater archaeologists is exciting, courageous and rewarding.